We are a company from Buñol with more than 10 years of experience bringing La Tomatina Festival to every corner of the world. Somos una empresa de Buñol con más de 10 años de experiencia encargada de acercar la fiesta de la Tomatina a todos los rincones del mundo. 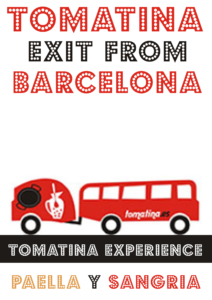 This ticket offers you a package tour to La Tomatina from Barcelona. La Tomatina is the most important festival of the summer. Thousands of people from all over the world come to have a date with fun. If you also want to join to live this experience and you do not know how to get to La Tomatina, take our bus and we will take you. The departure from Barcelona will be on 28th August 2019 from Plaza de España (Av Reina Maria Cristina) at 3:30 am, the return trip will be on the same date 28th August from Buñol (Valencia) at 14:30 pm, by coach. So, please, remember where the bus has parked in Buñol, it will be the meeting point to return back to Barcelona. Bus schedules may vary according to the punctuality of attendees. You can leave your bag with your personal belongings on the bus. When the Tomatina is finished, after the shower, you can pick up your clothes. If you want to go to La Tomatina After Party you can choose a bus returning at 6:00h 30th for an additional 20€. Please, bring a photocopy of your passport to La Tomatina.